At times the story is a bit difficult to follow but at the core of this beautifully shot action movie is a simple story: the captain of the emperor’s private above-the-law guard is betrayed. To redeem himself he must journey to bring back the royal seal. Along the way he meets up with a young woman, a bandit, and a magic enhanced female assassin. Action ensues. Will he succeed? Will he succumb to the young woman’s charms? Will the seal be returned? Will he defeat the assassin? The answers to these questions almost don’t matter. The action sequences, the swordplay, and the exotic scenery and costumes set in western China during the Ming Dynasty are what’s really on display here. Especially the action. There’s plenty of gravity defying wire work, lots of slow motion, smoke, and the constant sounds of clanging blades and singing steel. The fight choreography, increasingly fancy and fantastic as the movie unfolds, is front and center. 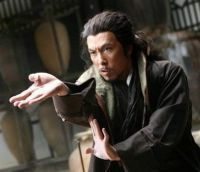 At the center of it all is Donnie Yen, of IP MAN fame. Reserved, calm, serious, and above all in peak physical condition, Yen is utterly convincing in what appears at times to be a spaghetti Western complete with ancient cities, desert vistas, and galloping horses. There’s a lot of exposition. I’m not sure the subtitles can keep up with the Chinese. At first this seems troubling. I soon realized it doesn’t matter. You’ve got a loyal hero, a heroine torn between loves, an exotic sword lady out to get Our Hero, and dozens of other characters who make the most of their screen time. The photography is gorgeous and ranges from dusty wide-open spaces to smoky dimly lit interiors. If you’re into action set in an exotic location in a time far away and you are willing to not give too much thought to the improbabilities, physical impossibilities, and coincidences on display here, this one’s for you! I loved it.